Founded in 1964, Reston is a planned community designed to follow ‘guiding principles” in its development that stress quality of life. Citizens are able to work and live in the same area and are able to go through different life cycles with different housing needs as they age. People are able to live, work and play in their own community with ample common grounds to share regardless of income level. The area focuses on land preservation and residents being tied to their community. 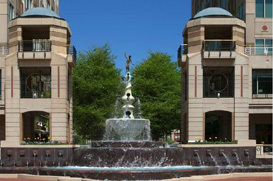 At the center of it all is the Reston Town Center which offers retail and office space as well as restaurants and entertainment. Reston was the first post-war community in the U.S. to use clustered townhouse development in order to preserve open space while still providing higher density housing. Other key features are access to public transportation and extensive walking paths connecting areas. Along with the town center there are 5 main village centers that cater to the denser developments of apartments and townhomes in Lake Anne, Hunters Woods, Tall Oaks, South Lakes and North Point. Originally owned by Lord Fairfax, the land was bought by C. A. Wiehle (for whom Wiehle Ave. is named) in the 1880’s. After his death, his sons sold the land to A. Smith Bowman who built a bourbon distillery and maintaining a farm on the rest of the acreage. The distillery continued to operate until 1987. In 1961 Robert E. Simon bought all of the land except for the distillery and envisioned a planned community. Reston, named by Simon’s initials RES, was founded in 1964 and was the first modern post-war planned community in America. The purchase of the land was funded by the Simon family’s sale of Carnegie Hall. Simon reached out to major architects to master plan and design the different neighborhoods. The careful planning and zoning allowed for the maximum amount of common grounds, parks and large wooded areas to remain undeveloped for the use of citizens. It’s progressive design and philosophy continues to attract residents and the area continues to grow and develop.